It's arguably one of the key gaming experiences to indulge in some light puzzling on a handheld system. Whether it's Tetris or Picross, nothing makes a morning commute or quiet evening more relaxing than letting grey matter and opposable thumbs work together to solve a problem. 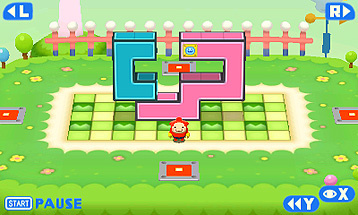 Pullblox / Pushmo is one Nintendo 3DS puzzler of choice. A simple premise of manipulating a structure to reach the top has served this series well for three games now - including an entry on Wii U - and this fourth arrival packages the various mechanics in those games for newbies, while adding new ideas to test the very best of push/pull-bloxers out there. This entry takes a rather different approach, acting as a free-to-play game in the barest way possible. In fact, when you download Fullblox / Stretchmo you are given a mere handful of tutorial levels that offer a slight taste of what this game actually offers. To call the initial free offering a demo would be a far more accurate assessment - the main Fullblox experience must be paid for, with four purchasable packs offering the rest of the content in separate chunks, with the requisite discount for purchasing all four. Fullblox's biggest gameplay addition comes in the ability to stretch objects. In Pullblox you pushed and pulled parts of a structure in order to make stairs to climb to the top. Its sequel was more about moving these blocks around and using gravity to place them in a fashion that would allow you to climb. 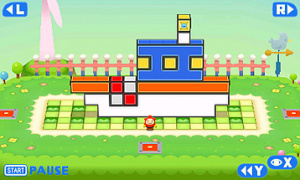 Here, the puzzles are fully 3D objects that are no longer moved, but stretched in order to make the platforms you need. It is now possible to rotate the camera around the entire structure, and the added dimension adds quite a difference dynamic to the series. In a way, it makes some of the puzzles a little easier in that you can give yourself a lot more surface space in which to manipulate the various blocks. However, the flipside is that you now have four sides of a structure to worry about, making it quite easy to get lost in some of the more complicated puzzles - but that's part of the fun, right? As for the downloadable packs themselves, they all add something to the table - from the 100-puzzle Mallo's Playtime Plaza, which is the ideal introduction to new players; to Papa Blox's NES Expo, which is 50 levels of nostalgia-based sprite structures which were the highlight of previous games' offerings (and are some of the hardest in the game). If you're going to get one pack, we'd argue you might as well get all of them, as they're all enjoyable and offer slightly different experiences - as example is Corin's Fortress of Fun, which adds enemies that can both help and hinder your progress. Buying all packs is in the same ball-park of price as the previous one-off games, in any case. A returning feature is the Studio, which is unlocked by purchasing any of the packs. Here, you can make your own puzzles in both the old 2D style or new 3D mode, share them with the world via QR Codes, or download puzzles made by other folks by viewing their QR Codes. As you can imagine, this leads to a potentially limitless number of puzzles to be played, and finishing levels in the purchasable packs unlocks new items you can use to build your own puzzles. This is another example of Intelligent Systems' knack for creating deep and involving gameplay using the simplest of mechanics. This is a fun puzzler that continues the superb work of its predecessors, although there could have and should have been more free to play levels to give potential players a little more incentive to purchase those packs. That said, fans of the concept and puzzle games in general should consider treating this like its predecessors - a stand-out puzzle experience. Got this on Saturday, on the recommendation of @JaxonH. I have all previous games and love them, and I love how (and no one seems to mention this enough) that you get to play as different characters here, including the great Papa Blox. Mostly an aesthetic change, but adding the new mechanic it adds freshness to the franchise. Uh, it's called Stretchmo. This site's anti-American bias is sickening. Wake up and smell the FREEDOM. I'm glad the review called it what it is, a demo. And I also think it's funny that it's actually listed as "Free-to-start" in the app, or the eShop, I forget which, just thought it was funny as I'm pretty sure Iwata was insulting free to play games when he coined that term. I let my kid get the "Fun Fort" pack b/c it has enemies so it seemed to add the most to the game. It was only $2.99 and it came w/ the editor so he has had a lot of fun making levels so far. I doubt he'll buy the rest. Nice review. And I didn't even have to pay to read the whole thing. And I skimmed the article and see know mention of the final group of 50 puzzles that unlock when you complete the 250 puzzles in the four packs. That's when the difficulty really ramps up! Liked both previous entries on 3DS. I almost finished Fallblox and I'm in the middle of Pushblox. I may consider this game when I'm done with the other two. @Stu13 Wait what? When they post about releases when they happen in NA the use the NA name. Where is the bias for using the name of the copy they reviewed? @Ryu_Niiyama You cannot honestly think that I was being serious. @Stu13 From my experience, you never know with Americans. Yeah I noticed the lower frame rate, that really irks me! Can't justify spending £8.99 on this to be honest, for the amount of puzzles you get I'm not sure it's worth it (previous games have 250 levels each and are almost half the price). Still need finish Fallblox, so difficult! @Stu13 Actually I did. I've seen more adamant posts by people that meant it and sarcasm isn't always easy to see in text. I'm also a literal person so I take a post at face value unless I see a sarcasm marker. My mistake. Really enjoying it so far, feels a much more natural evolution to the franchise than Fallblox was. For my money, Corin's levels are the best, adding a bunch of new elements to the formula. My only complaint? The name. Seriously NoE, Pushmo, Crashmo and Stretchmo sound cool and very Nintendo. 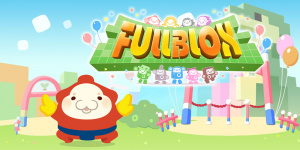 Pullblox, Fallblox and Fullblox sound like cheap iOS titles, not to mention all to similar! Nearly finished Pullblox and have a bit done in Fallblox and Pullblox World too. This is great. You should purchase the 3DS Theme too! @accc Yeah that bothers me too. It's not even really a consistent 30 fps, there are noticeable drops every now and then. So strange when the game's graphics look almost identical to the previous two. I think fullblox do deserve a 9/10 score. Also disappointed with the frame rate. C'mon now don't go insulting all of us like that. I may end up purchasing this. I've enjoyed the demo so far but I just have too much to play right now. Can't stop playing Shuffle, Xenoblade, and Devil Survivor 2. Usually in that order as well, once I get home from work. I was pretty annoyed that only the tutorial was free, that was like five minutes and it wasn't even fun. Not to say the game might not be great, but it seems like false advertising to me. @rjejr IMO it's really not a demo in the traditional sense, unless you choose to not purchase any or all of the other parts, then it effectively becomes one. I'm not fond of the "Free-To-Start" term, but that seems to me like the most accurate description of what it really is, just like Rusty's Real Deal Baseball, which btw is a great game. @MetaSmasher Nothing here is being misrepresented. An insufficient amount of free content (in your mind), and you not finding it fun doesn't constitute false advertising. I was going to give this one a pass because it sounded like a F2P game, but @JaxonH convinced me to give it a look and I'm glad he did. It's definitely not free to play in the traditional sense. It's basically a $10 game with a demo, but with the demo included in the game instead of a separate download. I'm having lots of fun with it! Whereas in Crashmo I had a hard time thinking abstractly enough to predict how blocks would fall to solve the puzzles, I find the stretching mechanic here much easier to understand and solve puzzles with. I think it's generous to even call the free content a demo. Meh. I'll just stick with regular old Pushmo. @Stu13 but your wearing all white... white clothing = freedom from the sun. this is serious beans bro. @Ogbert Ive always wondered the naming choice of NoE. Im Happy that here its called Stretchmo. but FullBlox? I feel sorry for you guys xD. PullBlox, FallBlox, and FullBlox is quite the mouthful when saying things altogether. "I was disappointed because it runs at a lower framerate than Pushmo/Crashmo. (Although apparently it runs better on the New 3DS.)" So I wasn't the only one who noticed this! When I first played it I thought: Are my eyes deceiving me, or does the game look stuttery sometimes? Probably won't be getting this despite the good review. I liked Pushmo a lot but I couldn't stand Crashmo. I can't even play that game for more than a minute. It's so much harder and so boring. I'd say this barely qualifies as a demo, the tutorials can be beaten in a roughly five minutes and that's if you take your time. I hope Nintendo doesn't make a habit of this. 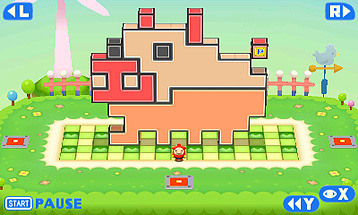 Demos certainly don't need to have a ton of content, but I wasn't really able to tell what made this different from Pushmo just based off of what was given. @davidevoid erm half the cost? the last one according to this website costs around $9, the Wii U release of the first one basically costed $10. The first one was around $6 or $7... so yeah. I'm less likely to get this game because its Free 2 start, i'd rather pay $5 and get 1/2 of the game and a bundle deal for the rest of the levels or something like that. Mine runs at solid 60FPS even with 3D on, I don't get all the complaints. New 3DS here by the way. I passed on Crashmo, but I like the new ideas here. I'll probably pick this up. Being able to actually walk around and inside a puzzle (hello, double-decker bus!) was fun. I have cleared only the first 130 or so fullblox (the first playground and 30 or 40 of the second), and for some reason, I've thought these have been easier than I remember Pullblox World having been (then again, I was stuck in Cheep-Cheep until past week, which may have coloured my view on it). And as for the Fullblox name - I like it. The worst I can think of it is that it resembles Boom Blox, which was a fun game series in its own right. The first thing I did was go in and unlock the whole game. The first two games are so good, I don't need to try before I buy with this series. @Uberchu You're right actually, forgot how much they were, Pullblox in the UK is £5.39 and Fallblox is £7.19 so definitely not half the price of the new one. Sorry about that! Personally I don't think you can beat the original pure gameplay of the first game, it's great! Fall and Fullblox kind of transform it in a way that it looses that purity. I purchased all the levels, as I have all the other games in the series. As to frame rate, I can honestly say, on my new 3DS, I have not noticed ANY lag. It also bewilders me, that on the original 3DS, there would be any lag. It is hardly pushing the limits of the handheld, which ever way you look at it. Maybe Nintendo will release a patcg if enough people notice, AND complain about it. It costs more money and has less content than the previous entries. The 'stretch' mechanic should have been another mode in Fallblox. No sale here I'm afraid. Why are the names for certain games (including the Pushmo/Pullblox series) different across regions? (Especially across freakin' North America and Europe?) It just makes things confusing and annoying, and it's just plain stupid. At least, in my opinion. There has to be a good reason why though, right? Iwata is a genius for coining "free-to-start." It's so much more honest and open. Thank you. Lovin' it so far. 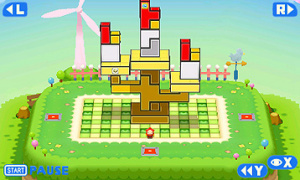 The timing of Stretchmo's release is perfect as I'm just finishing up the final puzzles in Pushmo. I've been playing FallBlox today and to me there seems to be a noticeable difference in framerate between the regular story puzzles and the prototype puzzles which are several blocks deep. perhaps this is the same issue experienced in FullBlox. @AcridSkull That is indeed the case, the prototype levels were only 30 fps but the rest of the game's levels were 60. I guess the original 3DS model just doesn't have enough juice in the tank to handle larger puzzles. It wasn't a big deal in Crashmo/Fallblox since there were only 8 or 10 prototype levels (IIRC) which had their framerate reduced. hey a new pushmo game, yay! here's the deets, its for 3DS this time, free to download, $10 if you just buy all the parts of the game at once, which i recommend if you've already played all the other games in the series and know what you're getting into. to buy the parts separately costs $14 so it's not a bad price or a bad deal. also, you can add funds directly while making the purchase in game, which you have to make the purchase in game, can't eshop that part. most important, the US title is STRETCHMO. it takes about 630 blocks to download, in case you wanted to know. @MetaSmasher Ok, if it isn't free-to-start, or even a demo, then what is it? IMO it's as advertised. You're complaining about something that was free. I just can't understand that mentality. Two years later and I have to admit I was wrong, this is a great game! Definitely up there with the first game yet it adds a lot of different mechanics that keep it fresh. A very solid 8/10 from me. Has anyone tried this on the 'New' 3DS? Curious as to whether this sorts out the framerate issues.